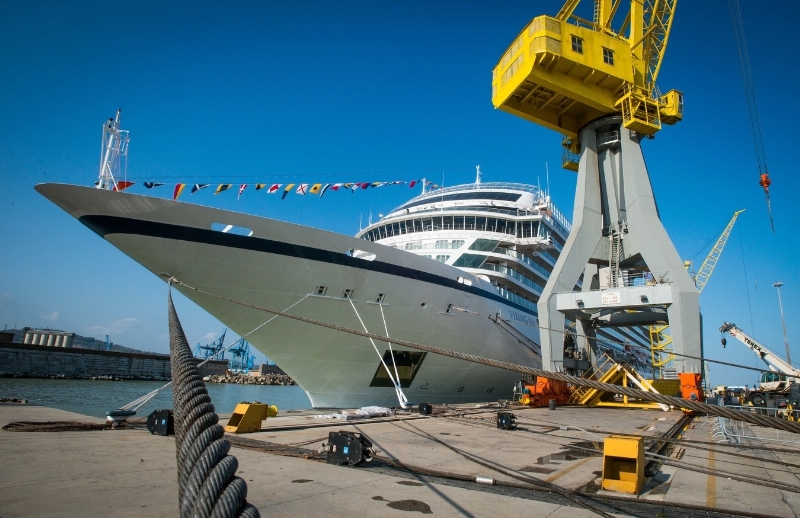 Viking Ocean Cruises has taken delivery of its second cruise ship, Viking Sea. The line has celebrated the float-out of its third ship, Viking Sky, and has also ordered three additional ocean ships for delivery by 2020. The delivery ceremony took place last Thursday at Fincantieri’s shipyard in Ancona, Italy. On 3 April, the 47,800 gross ton Viking Sea will sail from Istanbul on her way to be christened on 5 May in Greenwich, London. Following the christening, the 930-passenger Viking Sea will spend her maiden season sailing itineraries in Scandinavia and the Baltic, as well as the Western and Eastern Mediterranean. The delivery ceremony took place a day after Viking Ocean Cruises’ third ship, Viking Sky, was floated-out, marking a major construction milestone as the first time that the new ship touched water. It is due to be delivered in early 2017. Viking Sky‘s float out began at approximately 10:30am local time. The madrina was Marit Barstad, sister of Viking Chairman Torstein Hagen. She welded commemorative coins to the vessel and then cut a cord to allow water to begin flowing into the ship’s building dock. Two days later the ship was moved to a nearby outfitting dock ready for final construction and interior build-out. The company also announced that it had placed an order with Fincantieri for three additional sister ships, which will take Viking’s total number of ocean ships to six by 2020. The yet-to-be-named vessels are scheduled for delivery in late 2017, 2018 and 2020.